Let me start by saying that this week hasn’t been the most favorable for me, which is why this post is coming at y’all a little late (again). Sorry about that! Since returning from Mexico I fell down a flight of stairs, landed on my hip, and ended up with a bruised hip. On top of that Mexico has been wreaking havoc on my stomach the past few days, I won’t go into the details – but I’m sure you can put two and two together. Needless to say I’ve been moving pretty slow all week. Between the sore hip and lack of energy it’s been an interesting few days. Which leads me to my first point, The Kentucky Derby Festival Marathon is this Saturday. Yes, as in 3 days away. To be honest, I’m 100% terrified about taking it on. I was feeling real, real good about it, but doubt has set in, and it’s not been the best feeling in the world. 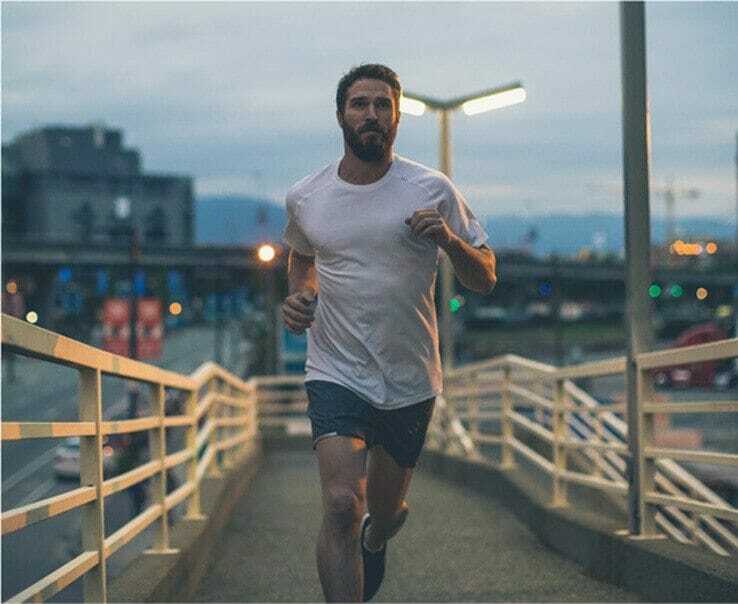 lululemon shared a post about turning your running into a moving meditation stating that running is 10 per cent physical and 90 per cent mental, and it seriously helped me put things into perspective. Banged up hip and queasy stomach be damned, cause I’ll be focusing on running meditation to get me through the 26.2 miles. Speaking of the KDF Marathon/miniMarathon, even if you have registered yet – you still have a chance to pick up a charity bib at the expo this Friday. Now that I’ve got the mental side of things down, it’s time to eat like there’s no tomorrow. Thankfully Gimme Some Oven served up some delicious recipes on her blog this week and last like her Chocolate Peanut Butter Green Smoothie (um, yum), Bacon Asparagus Pasta (carbs are a runner’s best friends), and Biscuits and Mushroom Gravy. OH also, if you like asparagus as much as I do she also shared 15 Amazing Asparagus Recipes. Word to the wise though – if you’re planning on running the KDF Marathon (or any marathon for that matter) don’t try ANYTHING new the morning off. That includes food. Stick with something that you know your body digests well. There’s nothing worse than dealing with stomach pains mid run, trust me. It may just be me being obsessed with food since getting home from my trip, or it’s very possible that all my blogger pals are equally as obsessed with it as well. Cause there’s been a surplus of killer recipes shared this week. From The Fresh Exchange’s Perfect Spring Pasta to west elm’s Smashed Eggs on Toast with Artichoke Spread. All of which have me ready to fire up the gas oven and try a little something new, how about you? While we’re on the topic of something new I’m going to adopt this as my new mantra. Another trend I saw on the blog I follow this was the fact that we’re starting to open up more. We’re beginning to make our blogs less about what we’re wearing, or what we’re eating, and more about who WE are. After all – I’d much rather have someone follow my blog because they enjoy me, how I write, and who I am than because of what I wear or how attractive I am. Because those things change, but I’ll always be me. Chelcey Tate sums it up nicely in her latest post, “A Little More Me“. Something else I have noticed recently is that some of the bloggers I follow serve as serious inspiration for me. Not only professionally, but also personally. One of the most inspirational being Authentically Emmie. While I’ve not gotten the chance to meet her yet, because of posts like “I Saw A Shooting Star” I know that she’s one of the most beautiful, genuine souls in the blogosphere. Remember how I was talking about following blogs because I enjoy the people behind the blog just as much as I enjoy what they write? Hommemaker is definitely one of those bloggers to follow for that exact reason. His personality and voice are just as enjoyable as the content he shares, and while it’s typically light hearted and LOL worthy in his latest post he asked if he was plotting his own demise, which really hit home for me. I’m always wondering what’s next, what will happen with the next guy I start to date, etc. I often times wonder so much that I self sabotage everything, and it’s great to know that I’m not alone in this line of thinking because it makes it a little bit easier for me to make an effort to curb the habit. Now that vacation is over, and my saving habits can be become a little bit looser for the time being I’ve seriously got the itch to shop, and the talk of a John Elliott + Co collabo with Bergdorf Goodman has got me seriously excited. Even though vacation is over, for now, Jessica’s post about Hilton Head Island has me more than ready to pack up for another trip. Luckily I’ve got a little something, something in the works with Garden & Gun, SBSCon, and a few other trips coming up. With all that travel coming up I’m definitely planning on doing a little (or a lot) of shopping to make sure I’m ready for whatever comes my way. Thanks to East Dane and their Spring Checklist and new arrivals shopping just got a helluva lot easier. Last but not least, if you’re looking for an easy way to keep up to date with all things The Kentucky Gent, be sure to follow me on Bloglovin’.